Our kitchen island is the center of our home. On one side, I prepare meals, bake cookies, organize groceries and just generally spend a lot of my time. On the other side we eat our breakfast, lunch, and sometimes dinners, my kids do homework, art projects and sit with their friends. I even use the space for projects and crafts. To call it a high traffic area is an understatement. When Glidden contacted me to try out their Diamond Interior Paint and Primer, which is 100% Acrylic and exceptionally durable, I knew the perfect place! 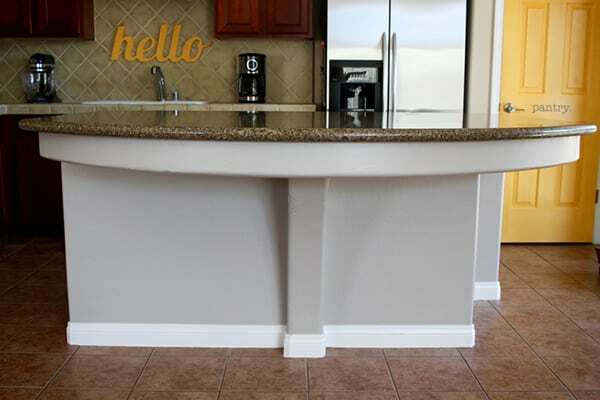 Our kitchen island was long overdue for a fresh coat of paint, so I was thrilled to partner with Glidden to share this project. 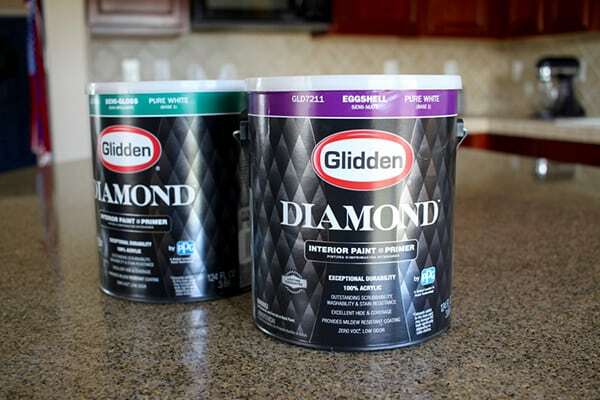 Glidden has been kind enough to offer 5 gallons of Glidden Diamond™ Interior 100% acrylic paint + primer to a lucky reader. You choose the color and sheen! Use the rafflecopter widget at the bottom of the post for this easy entry giveaway! Before we moved in, our home was a bank-owned property and the entire house had been freshly painted a great neutral beige color that I really like. Unfortunately, there was no touch up paint left behind and the paint used throughout was a flat finish. It looks really great, but in high traffic areas like our kitchen island, it has taken a real beating. 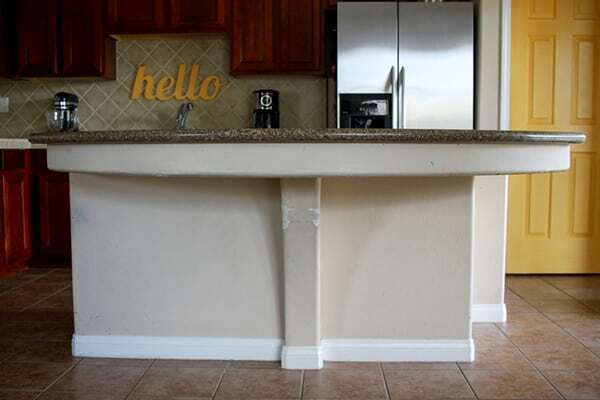 Here is a really embarrassing picture of our kitchen island before: shoe scuffs, paint splatters, and general yuckiness that can’t be scrubbed off. The center of the island was also damaged from our previous set of wooden barstools. Initially, I thought I wanted to repaint the island the same color, or as close to the same color as I could get. So, I headed down to Home Depot and picked up some neutral samples. 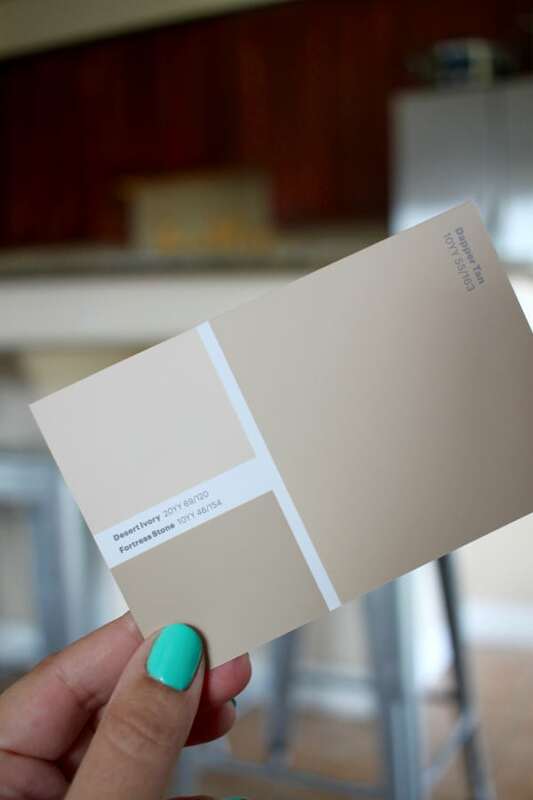 Dessert Ivory seemed to be the best match for the paint color used throughout our home. I then found this card in the Glidden paint section at Home Depot, a selection of Glidden’s most popular paint colors. The Stone Harbor Greige is the color I really wanted to try! I’ve been interested in repainting our living area with a “greige” color, a neutral that’s a mixture of gray and brown. Gray paints can be too cold, and though I love the warmth of tans and beiges, our living area is definitely dominated by cherry wood cabinets and cherry hardwood flooring. A greige paint could be a nice way to offset the brown towns. The only thing holding me back, since it’s just paint after all, is our massive vaulted ceiling in the living room and kitchen area. Any painting in our open concept living, dining and kitchen area will require more work than usual, or professional equipment to reach that high. So I decided to give Stone Harbor Greige a test run on our kitchen island. If we don’t like the greige tone in our living area, the island is easily repainted, and Glidden Diamond Paint and Primer is perfect for high traffic areas. For our kitchen island, I chose Glidden Diamond Interior Paint and Primer Eggshell Finish in Stone Harbor Greige and Glidden Diamond Interior Paint and Primer Semi-Gloss in Swiss Coffee for the trim. We cleaned the island and patched the damaged area. I painted the trim first with a trim brush, then rolled on two coats of Stone Harbor Greige. The coverage is excellent! As you can see, we have a lot of brown tones with the tile, cabinets, granite and backsplash. I do have my sights set on an update in our little kitchen, but for now I’m loving the freshly painted island. 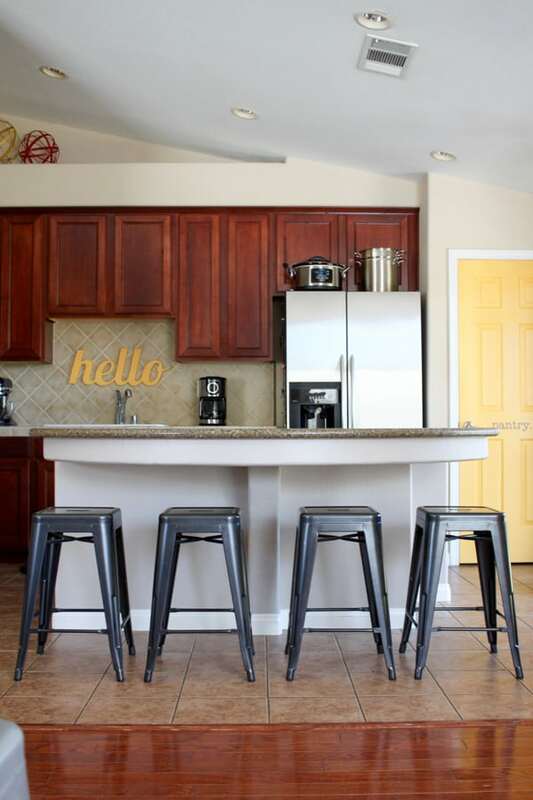 I also plan to add barstools in a fun color, like my favorite yellow, for a vibrant pop. Our current barstools are a light silver color, and they were a little blah against the new paint. 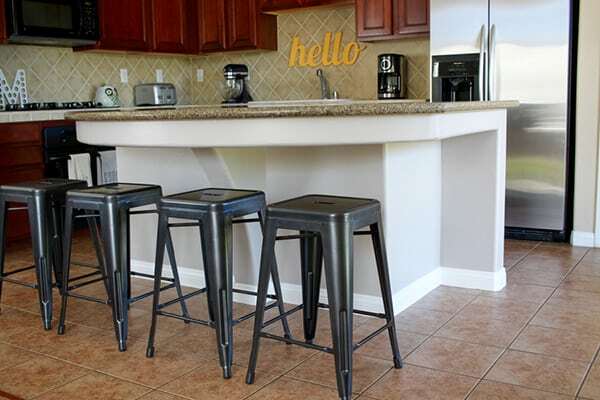 My sister kindly lent me her darker barstools for these pictures, and I love how they contrast with the Stone Harbor Greige! I think you can really see the difference between our older tan colored paint on the back wall above the cabinets and to the right of the fridge. I really love the new color, and I’m loving the durability of the new paint even more! Our toddlers high chair also lives in this area, so drops and splatters are inevitable. I love that Glidden Diamond Paint and Primer is exceptionally durable and scrubbable! 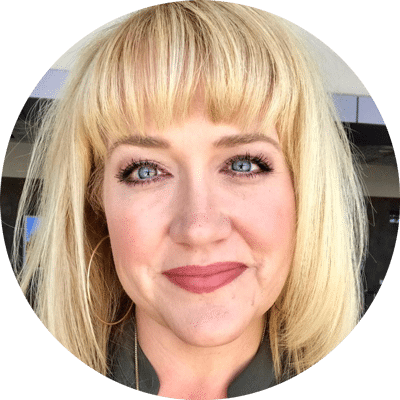 I’m thrilled to partner with Glidden to bring you this project and post. Glidden has been kind enough to offer 5 gallons of Glidden Diamond™ Interior 100% acrylic paint + primer to a lucky reader. You choose the color and sheen! What project is on your to-do list? Just follow the rafflecopter prompts below to enter the giveaway! 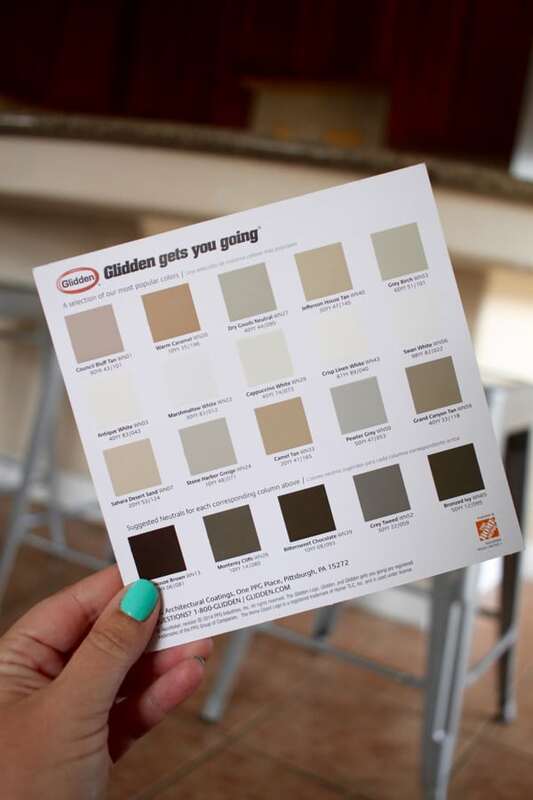 I love Glidden Paint and would love to try the Glidden Diamond. I have a hallway, dining room and living room that all need to be repainted. I would paint our cabinets! They are awful! I would LOVE to win this paint-Glidden, my favorite. I desperately need to paint my living room and entry and 5 gallons is just about perfect for the amount of painting that needs to be done. I even already have my color chosen! My bathroom & spare room are in dire need of a paint job! I would love to paint my new bathroom. I’m buying a house next month and this would be perfect! Thanks! I really have to paint my hallway! I’d paint my room, then all three of my kids rooms…oh heck, I would paint the whole interior!! I would love to paint my bedroom. It really needs it. I would love to paint my bathroom! It needs a new coat! I would paint our keeping room. I sure would like to give my kitchen a good painting. This post could not come at a better time. 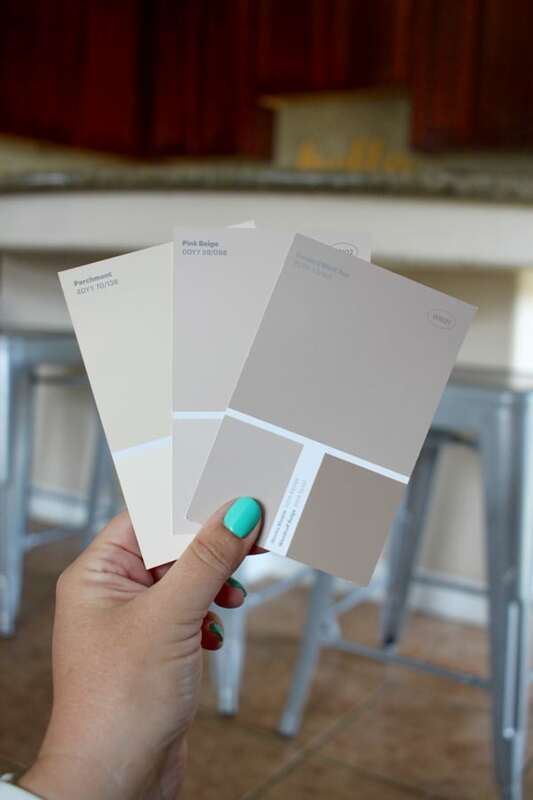 I am getting ready to tackle a whole-house redo and the color you chose is right up my alley! I am also going to be repainting furniture…I must be crazy!! I would love to win the paint! I would love to paint my livingroom. We painted it when we bought the house 5 years ago but the color is just not quite right. I dream of repainting it. I would love this for my kitchen cabinets! I love how that turned out Melissa!!!! Since we built our house 2 years ago we have been reluctant to paint anything- so we still have light cream walls everywhere. I’m ready for some change – so every room is fair game. I was just telling the hubs that I wanted to try this paint to do it. (plus I have about 11 pieces of furniture that are due for a makeover with my new paint sprayer) 🙂 I’m giddy- the hubs… not so much. Getting ready for kitchen update – thanks for the info. I would like to repaint my kitchen walls and cabinets. The ability to do it without priming the surface will come in very handy on the cabinets. I would love to paint my kitchen. It definitely needs a new paint job. My kids’ hand-me-down bunk beds from the 1970’s could really use a paint makeover. I’d like to paint my daughter’s room. I’d love to paint my kid’s room! We are remodeling our house this summer and have soooo many things that need to be painted. Kitchen, bathroom, etc. Our kitchen cabinets need some love. I would love to paint our nursery with this paint! I would paint my kiddos play room area!